Ahhh kielbasa. A throwback to my childhood and my Polish roots. Growing up, kielbasa and pierogies were staples in our household. As I’ve gotten older, I’ve started experimenting and seeking out different ways to incorporate kielbasa into meals. If you’ve never had it before, you should definitely try it. It is a smoked meat, WAY tastier than any sausage I have purchased. In fact, whenever a recipe calls for sausage, I always replace it with kielbasa :). 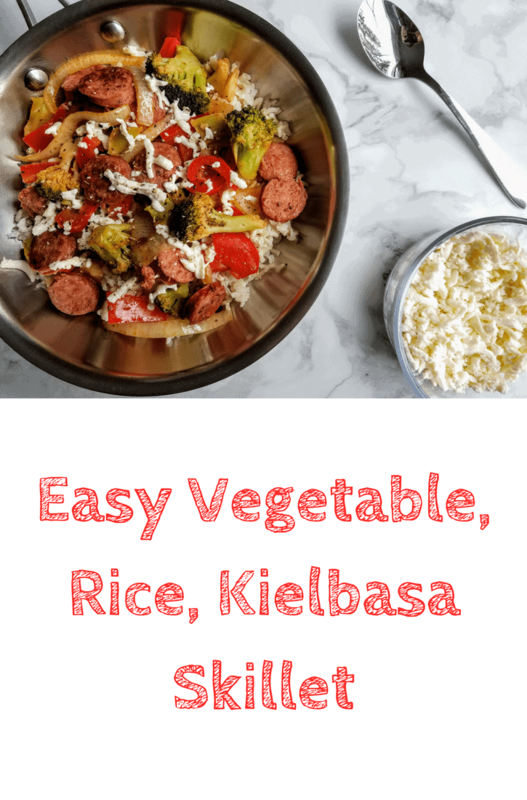 This Easy Vegetable, Rice, Kielbasa Skillet makes use of Kielbasa and combines it with vegetables, rice, and cheese for a filling meal. 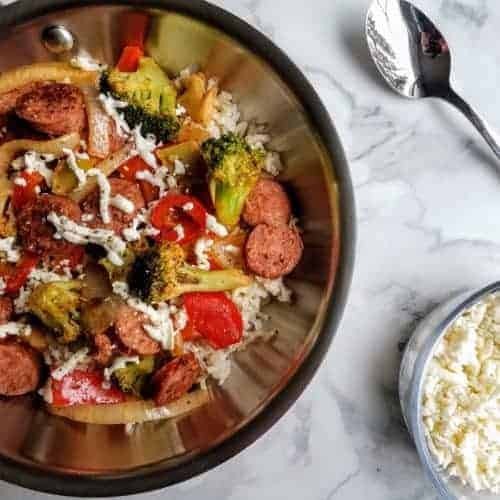 With minimal prep and cook time, this Easy Vegetable, Rice, Kielbasa Skillet comes together in only 30 minutes, leaving you plenty of time to unwind after a long day :). This dish comes together in under 30 minutes and contains plenty of protein and fiber, making for a filling meal. Prepare rice according to package instructions. For more flavor, cook rice in chicken or vegetable broth in place of the water. While rice is cooking, heat olive oil over medium-high heat. When oil starts to shimmer, add the kielbasa and brown (~5 minutes). Add garlic, cook for an additional minute. Add pepper, onion, broccoli, water, tomato sauce, Italian seasoning, salt, and pepper. Bring to a boil, then reduce heat, cover, and simmer for 10 minutes or until the vegetables are tender and most of the liquid is absorbed. When both the rice and the kielbasa mixture are each finished cooking, scoop some rice into a bowl, top with kielbasa mixture, Mozzarella and serve. For this dish, I prefer to refrigerate the rice and the kielbasa mixture separately. This way the rice doesn't get soggy upon reheating. Looks good! I’m not a big cook so I definitely need something “easy” to make! Thanks for sharing this recipe. This looks amazing, I can’t wait to try this one myself. This looks so simple and tasty! Would love to make this soon! Looks SO yummy. Will have to bookmark and try. Quick dinner ideas are ALWAYS going to capture my attention because who really has time at the end of a long day! Can’t wait to give this a shot. 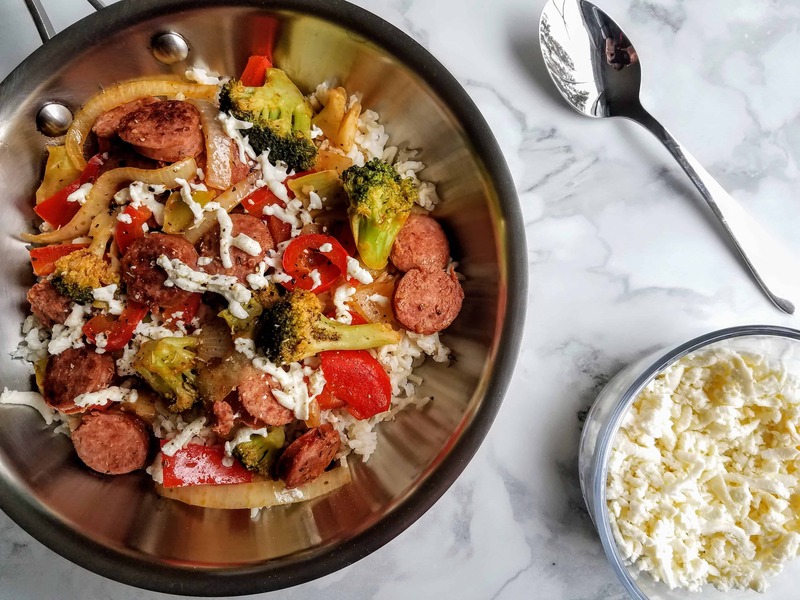 I always love to try new cuisines as I am such a foodie and while I am a vegetarian I am still excited by your vegetable rice and kielbasa skillet which sounds incredible. I would use some veggie sausages and the follow your recipe down to a T. And I have never tried a ‘pierogi’ before, what is it? It sounds tasty! This looks so simple t cook, plus I’m happy since it has everything vegetables and rice as well. SInce , I’m a vegetarian, I believe that I shall replace the meat with Tofu, whats say? I’m drawling right now with this recipe. Never tried that much polish food but this makes me want to book the next flight there! I’ve never heard of kielbasa, but it sounds like I really need to try it! This is a great recipe and I love that it only takes 30 mins. Will defo have to give it a go!